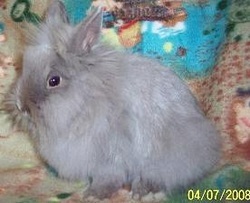 The picture on the left is a Lilac Lionhead doe. I will be breeding Lionheads and Holland Lop bunnies in the near future. Both breeds make excellent pets for children. They don't get bigger than 4 lbs and will use a litter box. I have for sale 1 Holland Lop buck that is 10 wks old and 1 Lionhead White baby doe with red eyes that is 12 wks old. We are located in Rio, WV which is 35 miles west of Winchester, VA. You can contact us via phone at 304-496-1444 or via email at kathyg51@frontiernet.net. 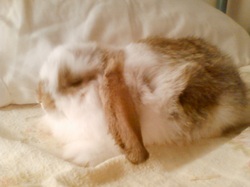 The picture below is a Holland Lop baby buck I have for sale. He uses a litter pan and is a sweet 10 wk old bunny. He is a Broken Tortise in color. He will not get bigger than 4 lbs when grown. Asking $25.00 for him. This cute Lionhead doe is 12 wks old and her fur is so soft. She uses the litter pan and has ruby colored eyes. She is for sale at $25.00.